BUFFALO, N.Y. -- M&T Bank and the University at Buffalo Athletics Department teamed up to provide about 40 fourth- and fifth-grade students from Westminster Community Charter School and Highgate Heights Elementary School with a unique sports-themed learning experience. 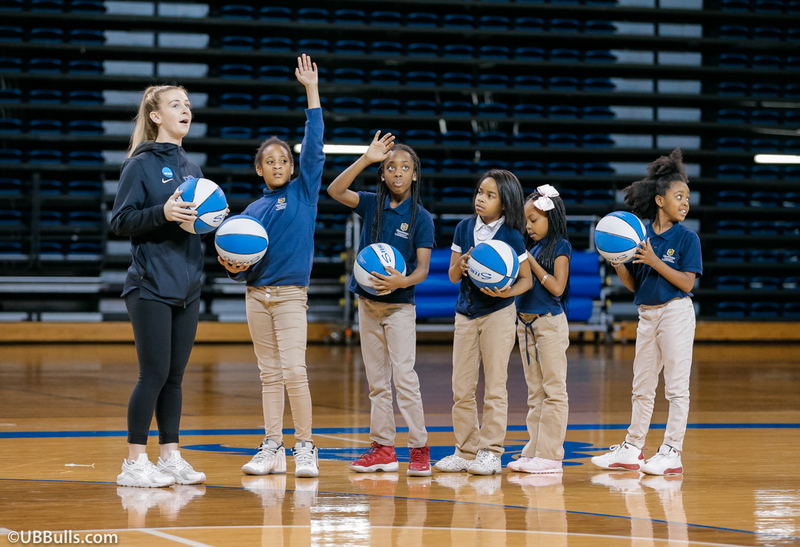 M&T and UB created Basketball 101 in 2015 as a way to encourage the elementary school students to work hard, commit to their academics and practice healthy habits. Featuring student-athletes and coaches from the UB Athletics Department, the program incorporates the basics of basketball, teamwork, leadership and healthy diet and nutrition. "The goal of the program is to take inspiration from the court and turn it into a fun educational experience," said Sean Quinn, Regional Retail Manager at M&T Bank. "Sports provide an engaging way to learn about the importance of higher education and a healthy lifestyle, and leveraging our long relationship with UB to create Basketball 101 is one way we're able to give back to the youth in our community." The program is also used as an incentive to promote perfect attendance within the two schools, which are both part of M&T Bank's Buffalo Promise Neighborhood. The classrooms with the best attendance during a four-week period between March and April were awarded with the prize of a trip to UB's Alumni Arena for the exclusive basketball clinic. UB Men's Basketball Head Coach Nate Oats and UB Women's Basketball Head Coach Felisha Legette-Jack welcomed the students, and several student-athletes on the men's and women's basketball teams participated in the drills and enrichment sessions. Three distinct stations were set up at Basketball 101 for groups of students to travel through and interact with staff, coaches and student-athletes. "The Fourth Annual 'Basketball 101' is a partnership with M&T Bank and Buffalo Promise Neighborhood that continues to exhibit our sincere commitment to be engaged with the community," said UB Director of Athletics Mark Alnutt. "This platform provides elementary kids the ability to step foot on our campus that might not have had this opportunity elsewhere. In addition, our coaches and student-athletes give back by teaching basketball skills, but more importantly life lessons, which I'm hopeful will touch individuals and have them realize what the college experience at UB is all about." Discussion around Academics / Leadership (w/ student-athletes). Basketball 101 ran from 10 a.m. to 12 p.m. on Wednesday, April 25, 2018. Lunch was served to all participants prior to the children returning back to school. About UB AthleticsThe University at Buffalo, The State University of New York is the largest university in the state system of New York. This flagship institution has nearly 30,000 students, more than 220,000 alumni worldwide and is an AAU member. Ranked 48th among all public universities in the United States, UB professional schools such as Law, Medicine, Dentistry, Business and Engineering are ranked in the top 100. With an aggressive plan in UB 2020, the entire university, including the Department of Athletics has immeasurable potential.